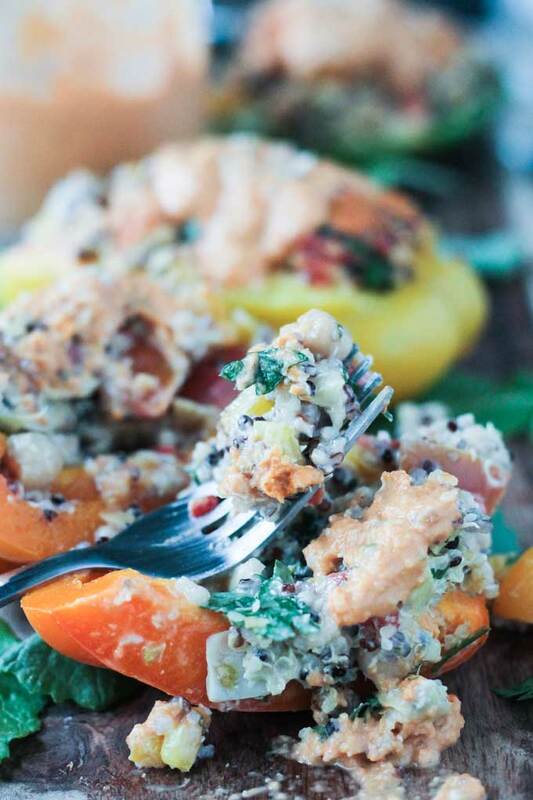 Mediterranean Stuffed Peppers – fresh and bright with the flavors of the mediterranean. A lightened up, filling dinner that’s perfect for spring. It’s officially spring! Time to put away our winter boots and say goodbye to the dark drab days of winter. I’m loving all of the sunshine we’ve been having lately and I’m drawn to all the colorful beauty that emerges this time of year. I couldn’t resist using different colored bell peppers in this dish. They just look so vibrant! And even though the stuffing mixture for these Mediterranean Stuffed Peppers is certainly filling thanks to the quinoa and chickpeas, it’s really quite light and fresh. It’s the perfect dish for an easy spring meal. The filling is creamy from the tahini, fresh from the tomatoes and parsley, tangy form the artichokes and roasted red pepper, crunchy from the diced bell pepper, “meaty” from the chickpeas and chewy from the quinoa. This dish has it all! And just like my Mediterranean Pasta, which has many of the same flavors going on, my kids and hubby declared this Mediterranean Stuffed Peppers recipe a winner! You could serve these Mediterranean Stuffed Peppers all on their own, or pair it with a salad, bowl of soup, or maybe just some crusty bread. They are just as good reheated the next day, so make extra and you don’t have to think about lunch. If you happen to have some filling leftover that didn’t fit into your peppers (though mine was a perfect fit), it would be great stuffed in a pita with some greens and cucumber slices…no need to even heat it up! You might want to also double up on the dressing to use for salads later in the week or to drizzle over roasted vegetables or buddha bowls or maybe even as a dip for raw veggies or crackers. It’s extremely versatile. 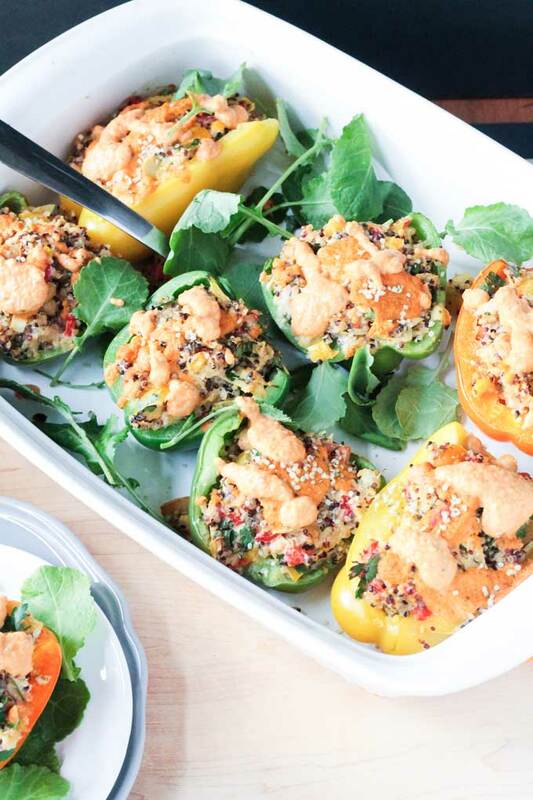 So, grab a fork and dig in to the fresh flavors of the Mediterranean with these easy Stuffed Peppers! What’s your favorite color of bell pepper?? We are partial to the red ones for snacking, but love them all in cooked dishes. 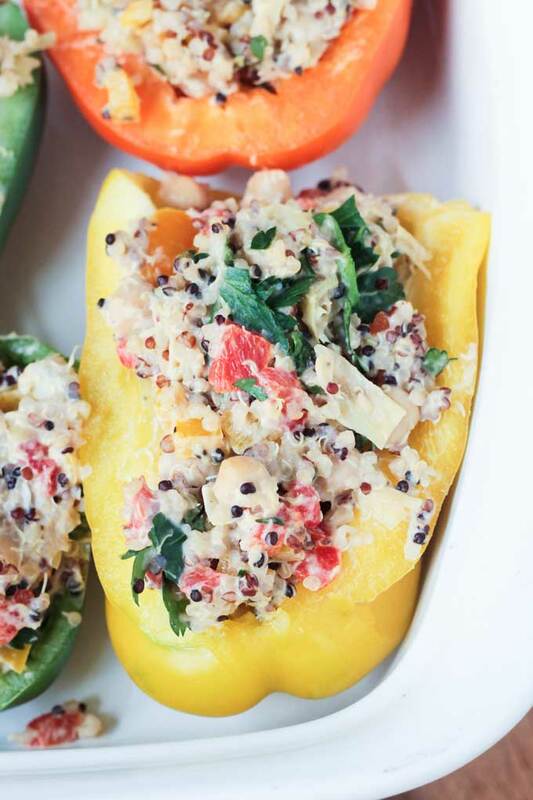 Mediterranean Stuffed Peppers - fresh and bright with the flavors of the mediterranean. A lightened up, filling dinner for that's perfect for spring. Arrange your halved bell peppers in one layer in the bottom of a 9x11 casserole dish, cut side up and set aside. In a medium mixing bowl, combine the diced bell pepper, roasted red pepper, artichokes, chickpeas, quinoa, grape tomatoes, parsley, diced garlic, 1 tsp cumin, oregano, juice of 1 lemon and 1/4 cup tahini and mix well. Spoon the mixture into the peppers in your casserole dish. Fill them up to the top. Drizzle about half of the Red Pepper Sauce (directions below) onto the stuffed peppers. Drizzle with the remaining Red Pepper Sauce before serving. Place all ingredients into a blender and puree until smooth. You can thin with a bit of water if desired. You can find this recipe linked up on Tinned Tomatoes: Meat Free Mondays as well. That red pepper sauce is beyond amazing!!! Pinning! 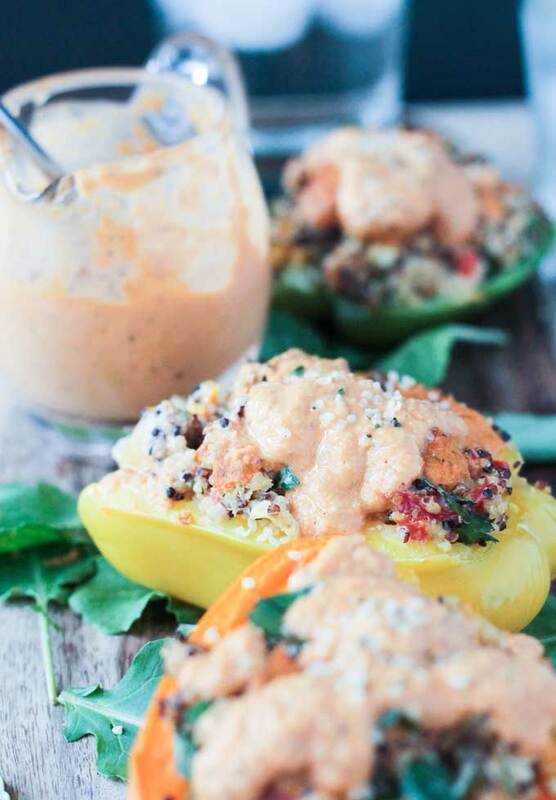 These stuffed peppers are loaded with deliciousness! Thank you, Abigail! I hope you get a chance to try them! 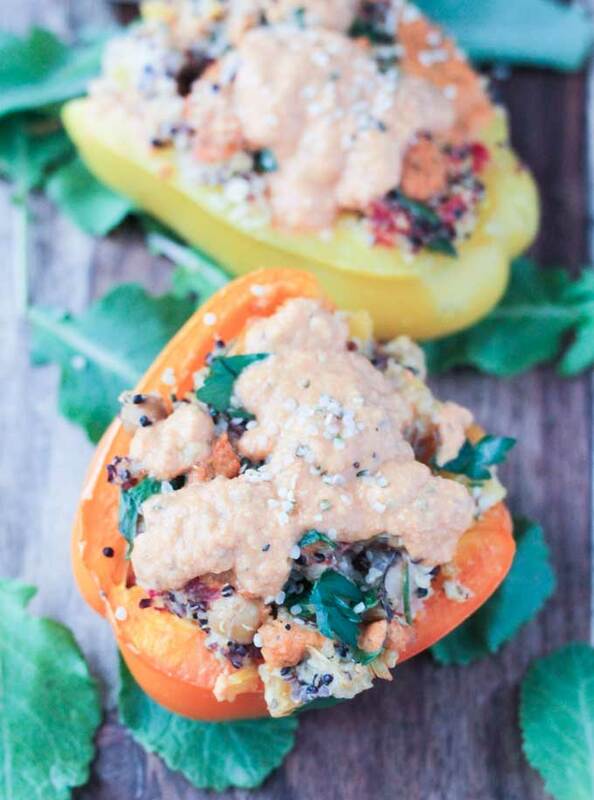 What a beautiful light stuffed pepper dish and I love the combination of flavours in the sauce! Thank you, Sonal! I hope you love it! Thank you, Sina! Let me know how they turn out!! Bell peppers are one of the wonders of the culinary world. They are just so vibrant as well as tasting fab. Your filling and sauce sound wonderful. Love it that we both made tahini sauce for our latest posts, but very different ones. Great minds think alike, Choclette!! 🙂 I LOVE tahini! These look lovely and I agree that they’re perfect for spring (although it’s still cold enough here to be craving stews!). The sauce sounds especially good! Perfect!! I hope you all love these! Thanks, Chris! My mom made a Greek stuffed pepper and tomato dish all the time when I was little. But then one day I got the stomach flu and they came right up. Have had a hard time eating them ever since but after I stopped eating meat and we started making the veggie version I love them again! This version looks delicious! LOL! Ah, the things we remember from childhood! Glad the veggie versions are sitting well with you! 🙂 Thanks, Sophia! Cool recipe, and reminds me to make them more often again! I love Mediterranean flavors and this looks so good! Love all the amazing textures as well The chickpeas and the red pepper sauce sounds scrumptious. I eat red bell peppers into a sauce pretty much weekly! Red peppers are the best, aren’t they? I buy 4-5 a week and they are always gone before the weekend. Thanks, girl! I love stuffed peppers! What a wonderful idea to take them into a Mediterranean direction. That red pepper sauce also looks absolutely delicious! Bring on the color! I’m drooling over your pictures Jenn. Those peppers look divine. And that sauce! Oh my, just give me the entire pan please. Thank you, Linda! It’s certainly not feeling like spring anymore. 🙁 At least these beautiful peppers can cheer us up! I cooked once stuffed pepper, that time it was huge hit in my family. so this time i will try this recipe. Looks delicious Jenn. Thank you, Uma! I hope you all enjoy it! I LOVE that you used red peppers in the delectably creamy sauce as well – absolutely delicious!! do i spy artichoke among all other deliciousness things?…i can’t wait to give this a try. Oh yes! I’ve been on an artichoke kick lately! Thanks, Dixya! I love a stuffed anything! These look lovely. Especially the red pepper sauce on the top. I definitely love that the sauce is good for other stuff. I can already think of a few things it would be good on! Its a double plus that your kids and husband tested it. I have 2 little taste testers at home too…they are tough critics! I figure if the kids like it, it’s a winner! 🙂 Thanks, Natalie! I never thought of that, but they would be perfect to take to a potluck! Great idea, Natalie! Thanks! I seriously cannot believe it’s spring already! It certainly doesn’t feel like it where I’m at (snow this week! ), but these peppers look like a dish to start enjoying now anyway. We are supposed to get snow this week too….and next week. But I don’t think it will be much…just some flurries. I’m hoping anyway. My dad said you guys had some awesome spring skiing weather a couple weeks ago, but then it got cold and windy again. The weather just can’t make up it’s mind this time of year! This is my kind of meal. LOVE Mediterranean flavours! Delicious. I adore stuffed peppers and your filling sounds delicious. That sauce looks great too. I love that they are great the next day too. That makes lunch so easy! I always make more dinner than I know we will eat because I LOVE leftovers for lunch the next day! Why make it harder than it has to be, right?! Thanks, Mel! Red pepper all the way! 🙂 And love the sauce..the cucumber’s going to add a freshness to it that is so Springy. Totally yum! Yes, thanks! I didn’t want to water down the sauce…the cucumber gives it the liquid it needs, but also adds great freshness and flavor! Thanks, Pragati! These are STUFFED! Literally read my mind though! I was just thinking about stuffed peppers over the weekend! Looks like I’ll have to make some! Great minds think alike!! 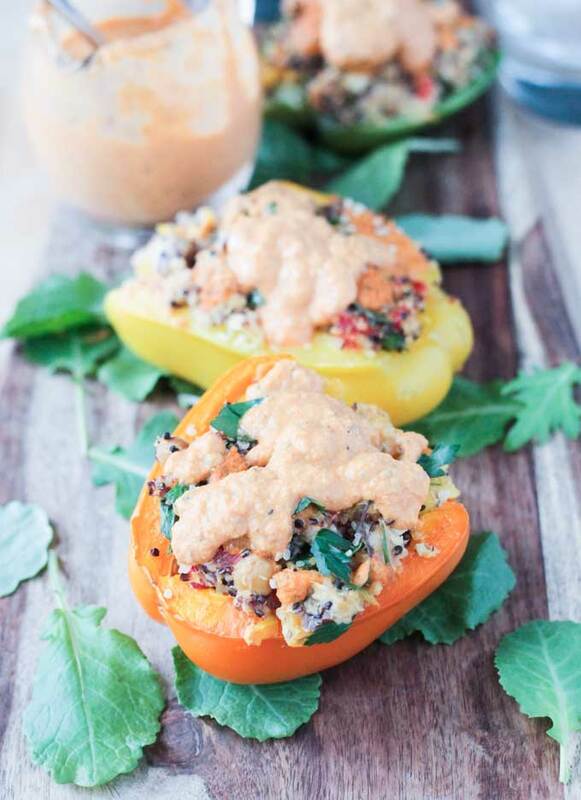 Stuffed peppers are not just for winter! Oh get in my bellyyyyy Jenny! This looks amazing. I just love carbs so much, quinoa, chickpeas and all covered with red pepper sauce sounds like heaven!! Thank you, Hedi!! Who doesn’t love a delicious creamy filling, right? Oh, these look great! I love how creamy the red pepper sauce looks!